1.) Kim Kardashian-Dubbed the ‘Queen of the Closet Organizing Scene’ Kim K used to have a high-end successful closet organizing business prior to her successful television show and pop culture icon status. Kim has said that organizing and decluttering her closet is the perfect way to spend a night at home. 2.) Courtney Cox-Known for straightening items on the set of her TV show Cougar Town, Cox loves a good cleaning challenge. Reportedly a bit of a minimalist and architecture and art buff, Cox loves keeping her home super neat and tidy. 3.) Gisele Bundchen-A newfound hobby after having children, Bundchen loves to nest and keep a clean home. 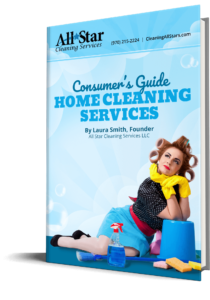 Called a “clean freak” by some, she loves to scrub and deep clean is reportedly obsessed with germs and warding off infections with diligent cleaning. 4.) Gwyneth Paltrow-Regularly receiving attention for her health detox cleansing lifestyle and philosophies, Paltrow loves sharing her advice and wisdom on her website Goop. She also loves regularly editing her closet and avoids shaking hands with other people because of trepidation about germs and bacteria. Paltrow is also a fan of Colloidal silver sprays for traveling and avoiding illness while on airplanes or in crowded areas. If you don’t’ have the passion for cleaning like these celebrities, why not leave the cleaning chores to the professionals? Call us in Fort Collins at: (970) 215-2224 or Loveland at: (970) 612-8772.